In June of 1863, the United States added the state of West Virginia to its ranks, growing to 35 states since Delaware became the first state in 1787. West Virginia was part of the state of Virginia up until April 1861, when West Virginia became the only state in the Union to secede from a Confederate state. The capital of West Virginia is the city of Charleston, however this was not always the case. The first state capital was the city of Wheeling, a city that held the title of state capital twice in the span of 22 years. Wheeling has a rich brewing history. During the late 1800’s, the city was home to over 20 breweries, with the oldest and largest, Reymann, starting prior to statehood, when the region was still part of Virginia. However as we have seen, week after week with these posts, the brewing industry in West Virginia feel to its demise with the passing of Yost’s Law in 1914. Yost’s Law was named after Lenna Lowe Yost. As the president of the Women’s Christian Temperance Union, Yost “proposed the 1913 enforcement act of the state’s 1912 prohibition amendment.” With the passing of Yost’s law, all of West Virginia’s breweries were either shutdown, or transformed to produce other goods, leaving a brewing void in Wheeling until the 1990s. …any law authorizing the sale of [intoxicating] liquors shall forbid and penalize the consumption and the sale thereof for consumption in a saloon or other public place. As a result, while beer was allowed to be sold in privately owned retail stores, a creative workaround was required to allowed the sale of beer in bars and restaurants. This workaround came about in 1937 when the definition of standard beer was changed to non-intoxicating beer. No longer considered an intoxicating liquor, beer sales in public places was again permitted. To this day, all beer sold in West Virginia is sold as non-intoxicating beer, with one minor change. In 2009, the definition of non-intoxicating beer was changed from having a cap on ABV of 6% to a new cap of 12% ABV, allowing many more craft beers into the state, including the one we have for this week. Breweries are now back up and running in the state. And with the ABV raised from 6% to 12%, they have the potential to produce some interesting and creative brews. However, West Virginia does not export any beer out of the state (that I could find), so we had to look into alternative means for getting our beer this week. Last January, as I was setting the staging for this project, I called a few breweries in West Virginia as I was cruising along Interstate 81 in Virginia. I figured if I had any chance of getting beer it would be while I was skirting the border. It was through these conversations that I learned about the limited distribution in the state, and that most of the beer wasn’t even bottled, but was draft only. But I did not give up. When I got back to New England, and was explaining this issue to a friend, he quickly mentioned that he had a client that split his time between West Virginia and our little New England town. He said that this client would be more than willing to help out with this crazy adventure. After a few email exchanges with James, things were not looking good. I continued to call around and email breweries in West Virginia, maintaining hope. In April, I got a reply from Bridge Brew Works. Try the grape and grain in Martinsburg WV – they may be temporarily out. I called Grapes & Grains, they do have a limited amount of Bridge Brew Works Beer on hand. The quest was over. Towards the end of April, James was in New England with a few bombers from Bridge Brew Works. There is more to the story about Grapes & Grains, and the visit by James, but we will leave that for our Idaho post. 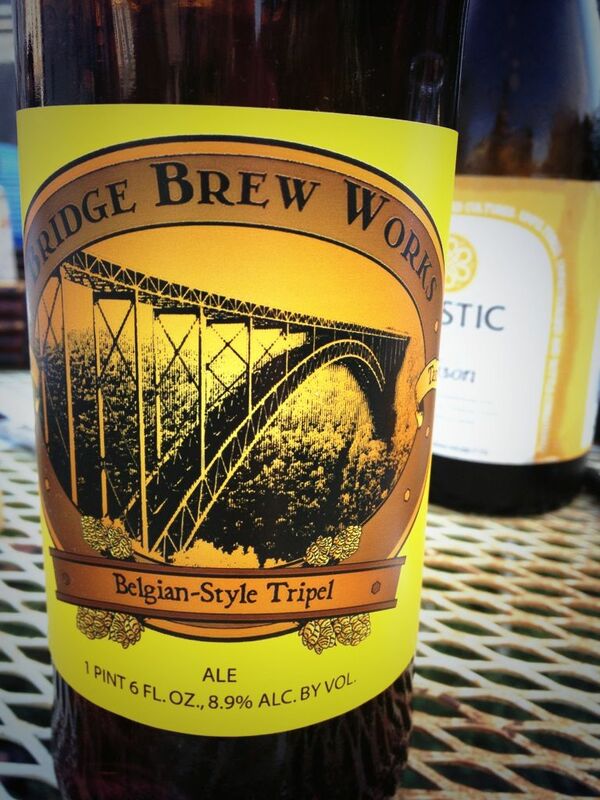 So this week, we have an Belgian-Style Tripel from Bridge Brew Works located in Fayetteville, West Virginia. Fayetteville is home to an impressive steel arch bridge, the New River Gorge Bridge which is also prominently featured on the Bridge Brew Works bottle. According to the Oxford Companion to Beer, a Tripel should show dense and mousse-like foam, bright burnished golden color, and complex spicy, floral, orange, banana, and citrus notes. This beer was a slight bit darker, and had a sweet smell and taste to it. I was clearly in the minority for this beer, as all of the others around the table didn’t really enjoy it, with some claiming it had a strange after taste. A quick search of previous posts shows that the Tripel style (New Jersey and Pennsylvania) was never really a hit. No Octoberfest beer until the middle of September! Thanks again to Peter for getting me in touch with James, and to James for helping keep the project continuing without missing a week. And with that beer from West Virginia, we are now at 35 consecutive weeks. Come back next week for a taste of some beer from Nevada.